The road from the border to Uspallata runs through the valley squeezed between huge mountains and a river. It was a very pleasant ride. I found a camp ground that cost NZ$11 for a night and pitched my tent there. Day 512 Friday 29th January 2016. It was an early start and a 470km day riding across the plains. There were a number of oil wells pumping. As I rode by I could smell the oil as it wafted in the afternoon breeze. It was another night of camping. This time it was at Malargue and cost NZ$5. I set up camp, cooked dinner and did a few jobs. One of the jobs was to file down my tent pegs where the ends have bent or broken off and replace some of the cord that goes through the other end. Day 513 Saturday 30th January 2016. Last night a storm hit the camp. I woke around mid night to hear the pitter patter of rain drops on the tightly stretched fabric of the tent. They say, if you count the number of seconds it takes for you hear the roar of the thunder after seeing the lightening, then you can approximate how many miles away the lightening was. Well five minutes after I first heard the pitter patter of rain drops on the tent then it was like a bomb going off. With my eyes closed the lightening was almost blinding. As the lightning flashed the thunder boomed so loud I could feel it through the tent. For the next 2 hours the rain was torrential, the lightning flashed and the thunder sounded like a lion tamers whip cracking. The water ran past the tent like a small stream and some seeped through the ground sheet wetting the underside of the mattress. Everything else was dry. In the morning it looked like there were plenty of people worse off than me. There were sleeping bags, towels and clothes hanging out to dry in the morning sunlight. I made breakfast and dried the mattress and tent before packing up and heading south down Ruta 40. Ruta 40 is one of the longest roads in Argentina and is renowned for passing through some of the more scenic spots. The road started off sealed and then turned into pebbles and gravel. It was quite corrugated and for the first part it was a 3rd and 4th gear ride. It wasn’t very enjoyable as some of the gravel was a bit deep in places and the bike front end was wandering. It was a matter of leaning forward over the front wheel and giving it some throttle. The road did improve and was smoother and ridable in 5th and 6th gears. The gravel finished and the road was smooth and twisting. The scenery was very picturesque with miniature Grand Canyon type views. Some of the ride reminded me so much of Central Otago in New Zealand. Lots of poplar trees. I haven’t seen much wild life for a while besides the odd donkey, horse, goat and cow. Today I saw a little armadillo meandering across the road. I stopped and turned around so I could get a picture. When I got to the place I saw him he had gone. The ride today was one of the most solitary rides I’ve had. I had the whole road to myself all day only seeing the occasional car travelling in the opposite direction. I’m pleased I carry extra fuel. I haven’t had to use it yet put the fuel stops are getting towards 250 to 300km range. I ended the day completing around 500km and camped at Las Lajos. Ruta 40 is mainly sealed but there are sections of gravel. The hills are remarkably red. In all the dryness there appears water and greenery. You don't want to break down here. There is no one around. Day 514 Sunday 31st January 2016. 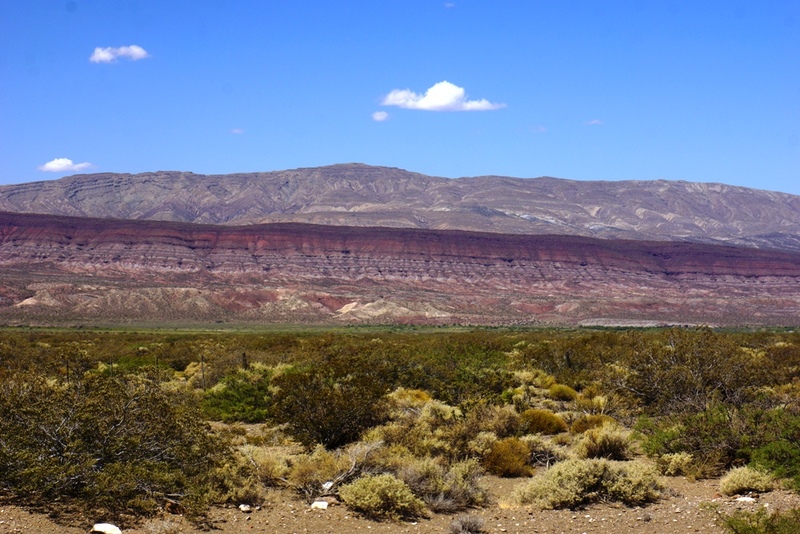 It was another scenic day travelling down Ruta 40 and then onto 237. The road took me past volcanoes, plains and the bluest of blue lakes. 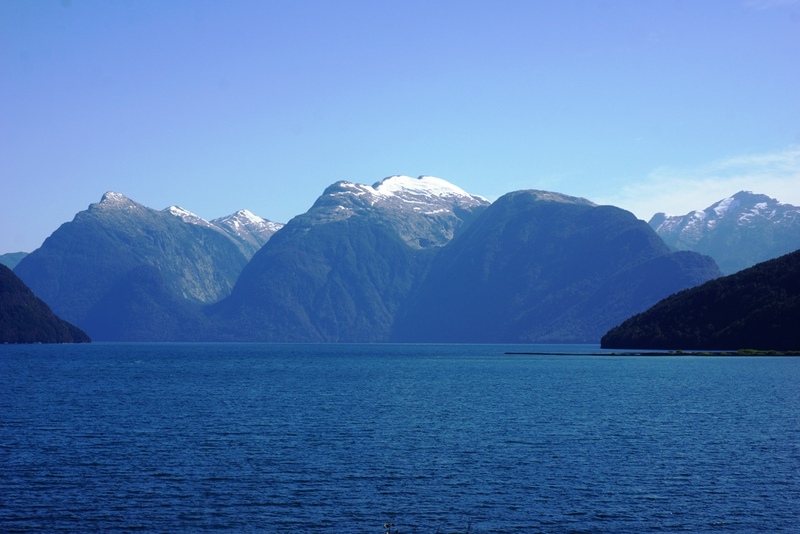 Of all the countries I’ve travelled Argentina is the most like New Zealand for it scenery. It’s the first place I’ve seen rugby posts since leaving the UK. Argentina even has the same plug sockets. It was another close call with fuel today. 350km travelled before I found a petrol station and 24km left in the tank. The wifi at camp was quite reasonable and I was able to phone home. It’s the first time in over a week. I either haven’t had wifi or if I had it was that slow I couldn’t even load a website or retrieve email. 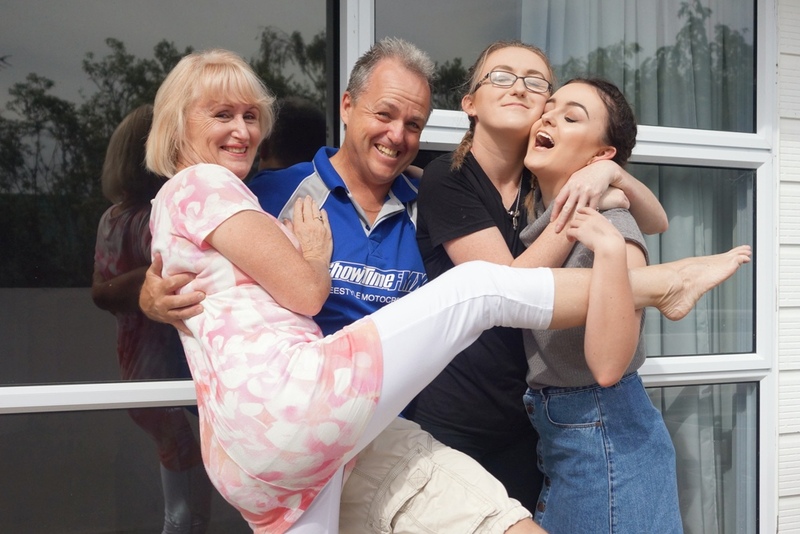 It was great to chat away to my family and have a good laugh. Once through the plains the scenery got more interesting. The water glowed sapphire blue. Day 515 Monday 1st February 2016. I continued south down the Ruta 40 leaving the mountains and lakes behind and entering more dry scrub and grassland. I fitted an accessory Madstad screen to Winston before I started the trip. It’s not going to win any beauty competitions but it would win the most effective at keeping the turbulence and wind off award. I always ride with my visor up on my helmet. The beauty of this is that you really feel part of the environment. The last few days have been like riding through an air freshener factory. The scent of the shrubbery just permeates through the air. As I’m heading further south the day light hours are becoming longer. The temperature is surprisingly warm in the 30c’s. 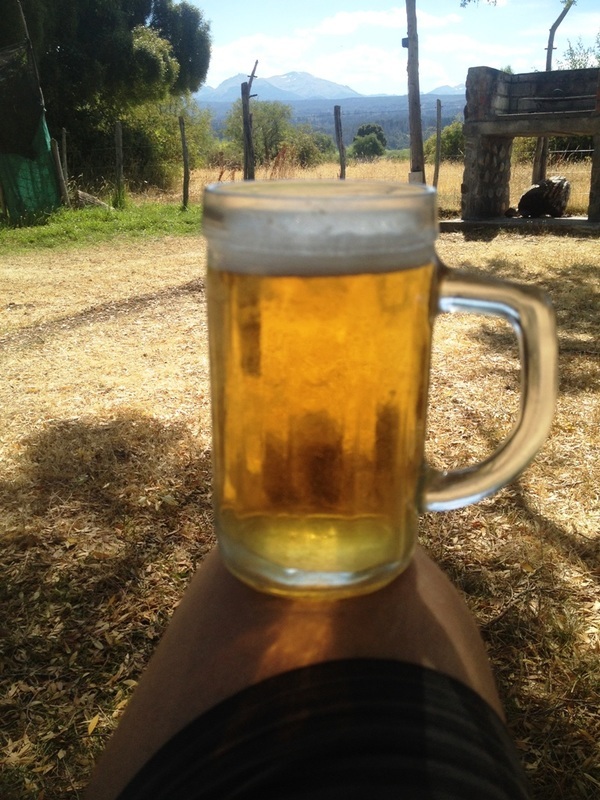 It’s another night of camping this time in Trevelin just 35km from the Chilean border. That’s where I’m heading tomorrow. Enjoying the view at camp. Crossing the Argentinean / Chile border was a breeze. I was through in less than half an hour. I left the camp tired and headed east on nice sealed roads to the border. 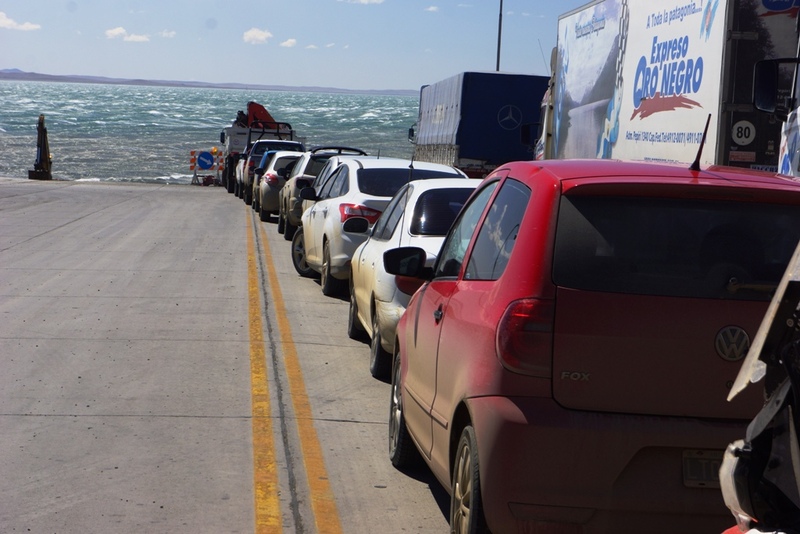 The crossing from Chile to Argentina was a doddle again. The sealed road from the border was in good condition and I made good progress. It was time to pull in for fuel, the only trouble is the first two petrol stations I called into had no petrol. I headed to the next town and found one that did but there was a 1.5km queue for it. As I rode into town I rode down the inside of a queue of cars, lorries and buses all stationary due to a blockade. There are many demonstrations and road blockages since the new government were voted in two months ago. It appears the previous government had paid a roading contractor huge amount of money to complete some of the roading system. The company went in to liquidation and most of the workers never got paid. The feeling is the heads of the company have stashed the cash and got away lightly. The new government had promised to sort these issues and haven’t. The crux of the matter is it is difficult to get fuel or enter or exit towns. I decided to head to the next town and hoped I would have enough fuel; I didn’t, so pulled over and filled up from my spare stash. I made it to the next town and had a 40 minute wait for fuel. 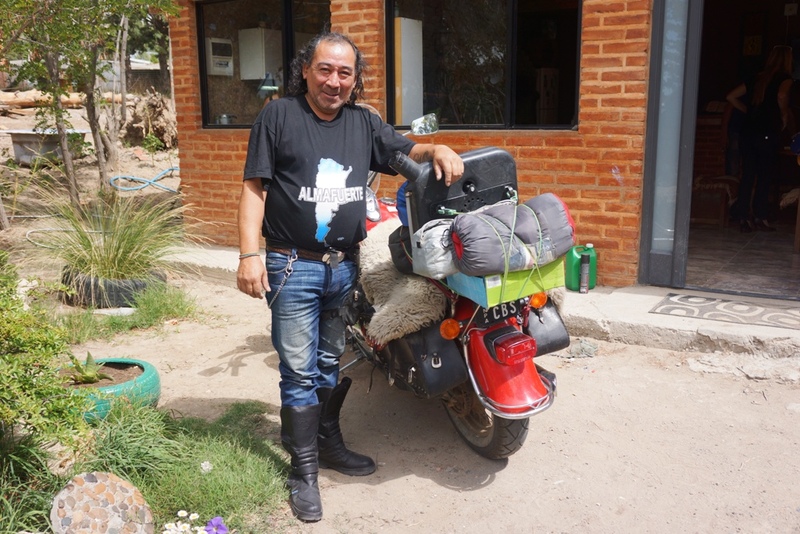 I finally arrived in Comodoro and headed to a campground not far from the address for the suspension guy. I will head there tomorrow morning. There are many oil wells in this area. 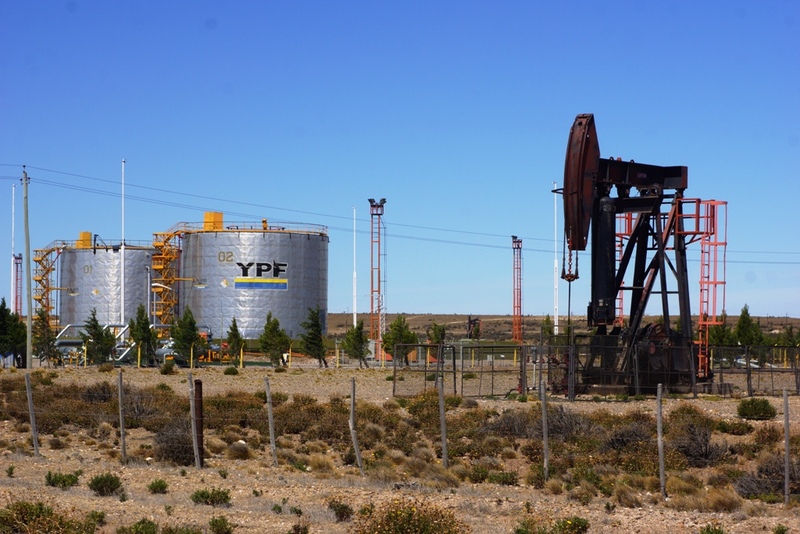 The oil industry is the largest revenue generator in this area. It's ironic that there all this oil but no petrol in the stations. I headed to the location where the suspension guy lived. I showed the address to a few people, they were no help at all. I tried the third person and he was the suspension guy. What a relief to know he actually exists. He motioned me to follow behind him as he drove his car to the workshop. When we arrived he and another guy whipped the shock out. The workshop was not well equipped and they didn’t have the tools to remove the spring. They tried various means but the final result was they couldn’t fix it. 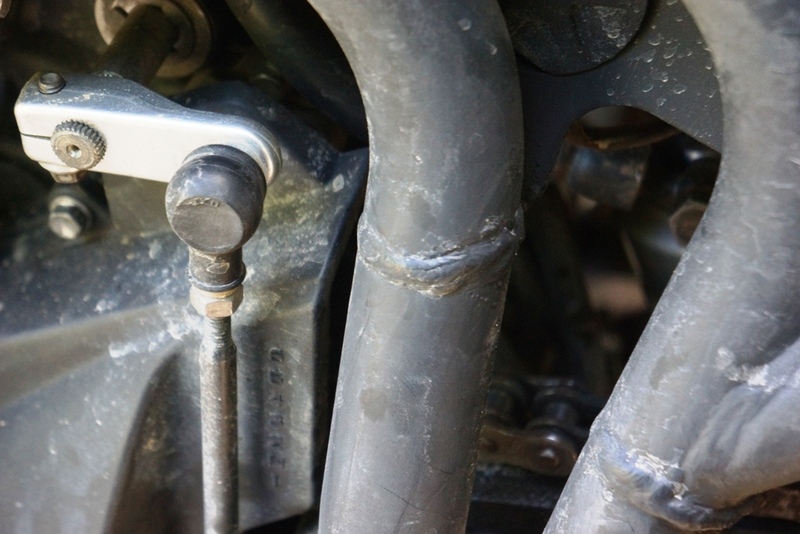 They rang around and the only person that could fix the shock was 800km south. Through Google translation they said that was the only option. I headed back off to camp feeling a bit dejected. 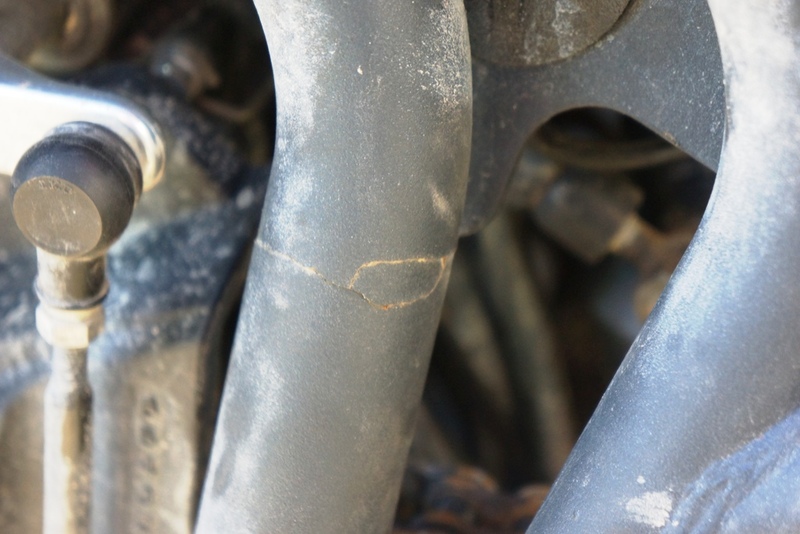 At camp I decided to a have a good look over the bike to make sure all the fasteners and other things were intact. To my horror I discovered what the cracking, snapping sound was I heard a couple of days ago. It was the left hand frame; it was completely broken in one place and cracked by the sub frame. On top of this discovery I found out earlier that it is a national holiday and everywhere is closed until Wednesday. That means I have at least another four nights here. To top it off it got cold and started to rain. I’m only 6000km from the end of my trip. I’m looking forward to getting home and seeing my family. This is really an inconvenience. The priority is to get Winston fixed and on my way. 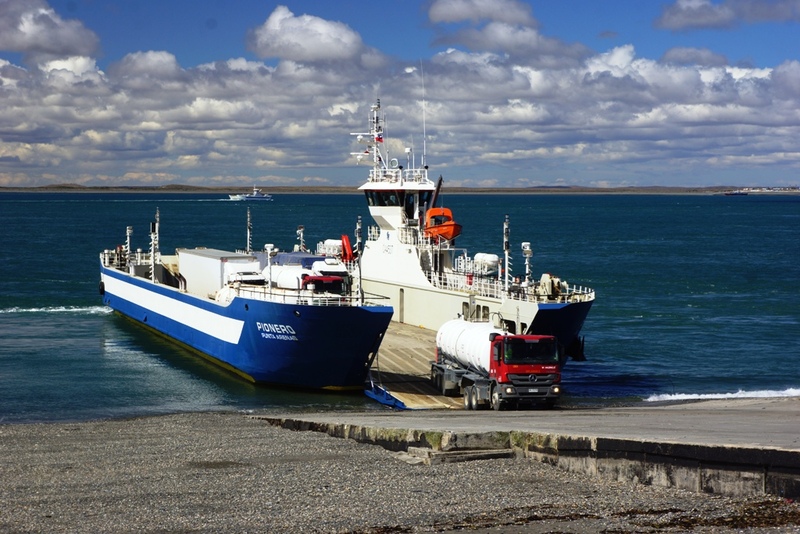 We will reach Ushuaia and we will complete the trip to Buenos Aires. As Winston says “we shall fight on the beaches, we will never surrender. Left hand side sub frame cracking. It got worse. Besides the rain last night the owners of the camp had a party and that didn’t end until 3pm. I’m so much looking forward to get a good night’s sleep again. I spent most of the day communicating badly in Spanish and English to the camp owner’s nephew. He reckons his uncle knows many professional welders and he will help arrange the repair. The only trouble is the owner speaks no English so communication will take forever and be a problem. I don’t actually hold out much hope but at least it’s a lead. The nephew came over to me at 6pm and said the guy would be here to weld the frame at 8pm. I thought great, I will be able to head off tomorrow. I disconnected the battery and ECU ready for the welder. When the welder arrived he said he couldn’t do it as he needed a MIG welder and wouldn’t be able to get one until Wednesday. What a disappointment. They said they would weld the frame 9am Wednesday morning. The camp owner’s brother is the guy who will do the welding invited me to his house to meet his family which I accepted. We all then came back to camp and had dinner at the camp owner’s house. 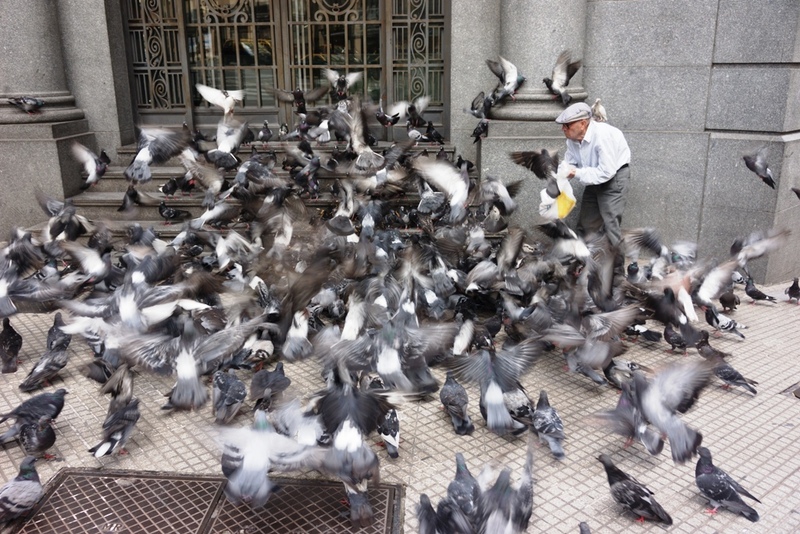 They eat really late in Argentina, after midnight. The alcohol was flowing and it didn’t stop until 4pm. I then headed back to my tent for a well needed sleep. The camp owner is letting me stay free of charge until my bike is fixed. He and his brother are fellow bikers. It’s a very kind gesture. It seems a long wait until Wednesday when I will get the frame welded. There is nothing around this location to view within walking distance so I’m forced to stay at camp. I don’t want to ride Winston with a broken frame, who knows when the crack in the sub frame will break through. There is a shop across the road I can get supplies. They have the freshest bread rolls and I’ve been making a bit of pig of myself. Today I did my washing and gave Winston a good wash down. He was absolutely filthy from the gravel roads. In the afternoon I watched a movie on my net book. It’s very boring being stuck in one place and not being able to get out. The day goes like this. Get up, boil some water, cook some breakfast, eat some breakfast, drink some tea or coffee, and wash up. 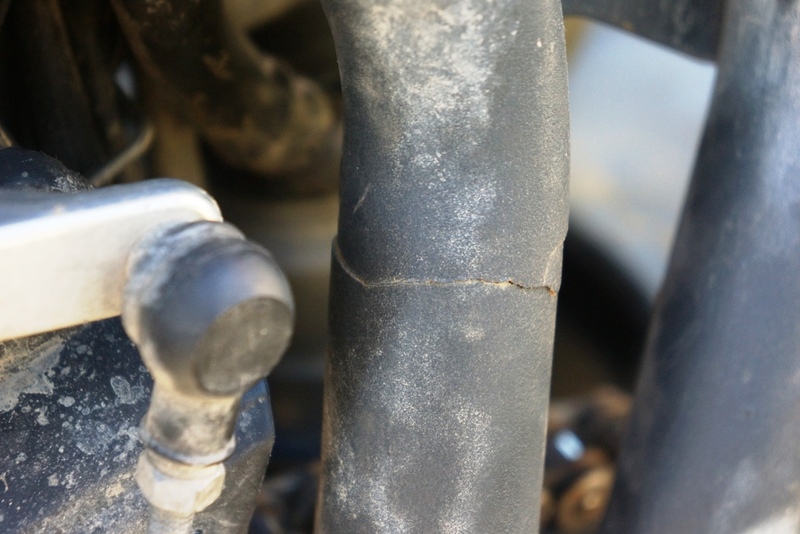 Use the very slow internet and try and locate someone to fix the rear shock. Then ponder what to have for lunch. Make some lunch, eat some lunch, wash-up, drink some tea or coffee. Try and find somewhere via the internet to get my shock fixed. Ponder what to have for dinner, walk across the road to the shop, buy some food, cook the food, eat the food and wash-up. The camp owner, his wife, brother and his brothers wife like to party. At 1am I was woken by loud Argentinean folk music and there drunken voices attempting to sing in tune to the music. This went on until 6am. I vaguely remember what a good night’s sleep is. Today was the day the frame should get welded. The camp owner’s brother was very drunk last night so his nephew who is 38 came over and told me in very limited English that the Mechanic who would do the welding will do it at 1:30pm today. This was a surprise to me as I thought the camp owner’s brother was doing the welding. At 1:30 the nephew came and said it would now be at 4pm. At 4pm the camp owner’s brother came over and said tomorrow at 10am. I hate being messed about, so was beginning to get frustrated by the constant change in times. I had a feeling that there was actually no mechanic lined up to do the work. At 10 am the nephew came over and said the mechanic would be ready at 1:30pm, this was getting more like ground hog day. I made the most of the time and headed into town to find some suspension places to fix my rear shock. I had found only one place on the internet a place called S M Motos who are Kawasaki dealers. I arrived and of course no one spoke English, which is not surprising as it’s a Spanish speaking country. I motioned and drew on paper what I wanted. The guy was very helpful he brought up Google translate on his phone. In the end they couldn’t do it but he sent me to a place that could. When I finally arrived there I spent over an hour trying to get them to understand what I wanted. It looked to me like they wouldn’t be able to do it. I asked if they knew a place that could. The guy jumped in his car and got me to follow. He showed me the shop and drove off. The shop was closed. I found out it would be closed for another three days. I decided to head back to camp and see if I could find the Yamaha shop I had passed on the way. I found the shop but they were not interested in doing the job. They told me to go to KTM which was up the road. When I got to the KTM dealer the guy there could speak limited English, enough to be able to communicate that they could do the shock and weld the frame and it could be finished tomorrow. The downside, the cost 10000 pesos, which is over NZ$1000. I was blown away by the cost. I disputed the cost but they were in the power seat. They said come back after 4pm and speak with the mechanic. The good news is they can do the job, the bad news the cost. At1:30 I knocked at the camp owner’s door. The camp owner’s wife answered in her nighty. I motioned to her that it was 1:30 and to get the brother in law. She went away and motioned come back at 4pm. It was clear the brother in law was sleeping off his hangover. Due to his unreliability I felt I had no option but to deal with the situation myself. At 4pm I Google translated to him that I had found some where to do the frame and the rear shock and thanked him for his help. He sounded relieved. I don’t think he had any one to do the job and this allowed him to save face. I then headed off to the KTM dealer, negotiated the price down to 8000 pesos, NZ$800 still feeling like I was being raped, left Winston. They guaranteed me that the frame and the shock would be fixed and ready to pick up at 5pm tomorrow. I then attempted to head back to camp. Eventually I got a taxi the 11km. My helper Indio, the camp owners brother about to head off on a road trip. I finally was able to get my net book to connect to the camp wifi so updated my blog, well almost all as the internet went down. It’s on and off like a cat on a hot tin roof. I spent the rest of the day waiting to head off to pick Winston up. I had to pick him up at 5pm. At 4pm it was time to head off from camp. Just at that exact moment, the moment I was changing into my riding trousers the rain, thunder and lightning came. I rushed up to the camp house and knocked on the glass door. The people inside just looked at me. I was starting to get wetter and wetter. Finally one of the women came over and opened the door; the woman was the camp owner’s wife’s sister. On Google translate I had written can you please call me a taxi I need to go to this address. The woman via Google translate said I will take you but you need to pay me cash. I asked how much, she said 200 pesos, I replied it only cost 135 to do the same trip in a taxi, she got a bit upset. She rang the taxi and she said the taxi won’t come because it’s raining. Am I living in a dream world or is this just a bad nightmare I thought. What taxi won’t pick up a fare because it’s raining? The only other scenario is the woman was lying. She went back inside the house. By this time there were some teenagers around me. I decided to ring the KTM shop via Skype, I have no sim in my phone. I managed to get through and spoke to someone who could speak a little English. The call kept breaking up and dropping out. One of the teenagers offered to lend me their phone so I could call. The call revealed that they had not even started working on Winston. Apparently the welder had broken and now there was a backlog of jobs. I pointed out the welder does not stop them fixing the shock. I told them that I was not happy that it wasn’t complete and that I trusted them when they told me it would be ready to pick up today at 5pm. I asked them when it would be ready. He said I’ll check and ring you back in 15 minutes. Fifteen minutes later he rang me back and said it would be ready Monday at 3pm. I responded are you absolutely sure, do you guarantee this. He guaranteed this. As it turned out it was just as well I couldn’t get a taxi because it would have been a wasted trip. It means another three days in camp. Day 527 Saturday 13th February 2016. Last night it was very windy, my tent was being blown around and the trees were swaying backwards and forwards like a group of drunken sailors on shore leave. When I got up this morning it was decidedly chilly. Most of my clothes are in my pannier, so all I have is a pair of shorts, t shirt and sweat shirt. As I went to sit down at the camp bench to get a brew on, a young guy came over from the log cabin in the camp. He had seen me rubbing my hands together to try and warm up. 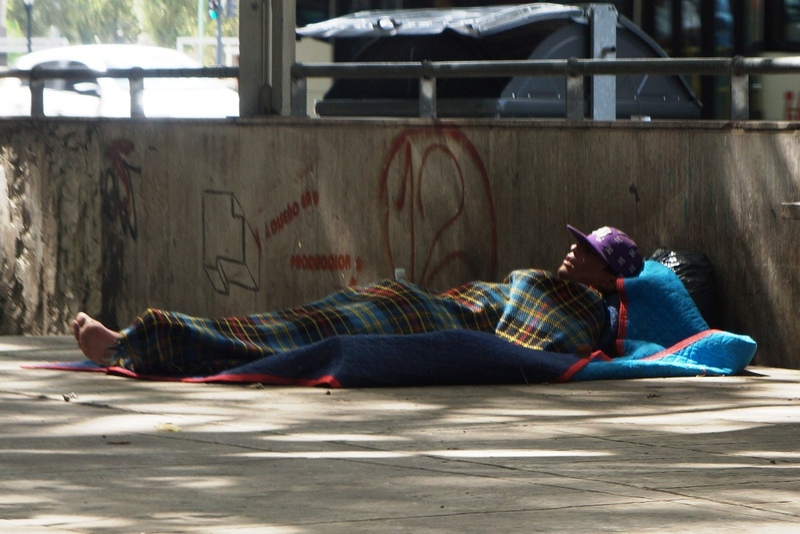 He brought out a pair of tracksuit trousers, socks, jacket and a blanket. He also brought me a cup of tea, some bread and sausage. What a very kind gesture. A while back he brought me out a cooked lunch. He must be in his mid 20’s and married. He lives in log house in return for caretaking the property. It’s so refreshing to meet people like this. I always feel humbled by their generosity. Later in the day I took the clothes back to his house. He invited me in and made me lunch. He wouldn’t take no for an answer. We chatted via Google translate. It’s difficult at times to understand the translation but we managed to understand enough to have a conversation. I told him I was catching the bus into the city and 2:30 to go to the bank. He said he would take me as he had to drop off some rubbish from the camp and we could stop and checkout the house he is building, it was on the way. I helped him lift the 40 gallon drum of rubbish onto the pickup. The camp owner’s wife came over looking angry. In her day she would have been quite attractive. She is 50 now and the years of drinking and smoking have really taken their toll, she now looks like a bottle blonde Tutankhamun mummy. She’s a miserable woman; in all my time here I haven’t seen her smile once. I think she has some deep seated problems and that’s why she’s drunk every night. She was in an angry mood and started spitting venom in Spanish at me. I had no idea why she was going off. When we got in the car the guy said she wants you to pay. I said the husband had said I could stay free of charge until my bike was fixed. I knew this would be the case. Her husband is away so now she is trying to extract money from me just like her sister yesterday. The young guy said she is a crazy old woman just pay and the problem will be gone. The money was not the problem it’s the going back on your word was the problem. A man is only as good as his word in my opinion. When we got back to camp I went to see the woman and on Google translate I wrote. Your husband said I could stay free of charge until my bike was fixed. You were there when he said it and I am most grateful for this help while I am stranded. She wouldn’t look at the translation so the young guy said it in Spanish. In Spanish she said I want money now,. On Google translate I said please ring your husband and discuss it with him. The young guy passed this on in Spanish. In Spanish she said I want money and then slammed the door right in my face. I must admit this really made me upset in side, but I refused to show it. I knocked on the door and said Hey that’s a bit ignorant, she then walked into the kitchen, turned around and walked towards me. In her hand was a gun, it was pointed right at me. She was ranting in Spanish. The young guy grabbed me and said Loco which means crazy. I was able to see it was only a small calibre gun, more than likely just an air pistol but the fact that this mad woman would pull a gun on someone for knocking on her door gives you an insight into her mental state. The young guy told me she was going to call the police. I was in a no win situation. She knew I was due to pick my bike up tomorrow and knows I will be gone before her husband returns. If the Police got involved in would be a nightmare as they wouldn't be able to speak English. I decided to pay her and make the problem go away. I made sure I got a receipt because she is more than capable of saying that I hadn’t paid. In one day I had seen the best and the worst of my fellow man. I had seen a sign up the road saying camping, I really did not want to pay this woman a cent more,. It was a kilometre up the road. I walked up there asked around and the only camping is where I am now. I have to stay here I have no option. Day 528 Sunday 14th February 2016. If the wind the other night was strong then this was almost gale force, it howled. At 4:30 am I here a voice call out to me. It was my friend from the log cabin. He had brought across the clothes and blanket for me again. I don’t know what he was doing up at that time of the morning. I spent the day living ground hog day until tomorrow comes. Day 529 Monday 15th February 2016. Today was the day I was promised that Winston would be ready to pick up at 3pm. I decided to get the bus and get there early so I could encourage the shop to finish the work on time. The bus cost NZ$0.90 which is good value for an 11km trip. When I arrived at the shop at 10:30 am Winston was ready and waiting. I was elated that my expectations had been surpassed. I checked the work; it looked to be done correctly. I paid the bill and headed off to buy some oil and a drain pan. I got the oil ok but they had no drain pans. I brought two square plastic fruit bowls for the grand total of $5.These would be fine to drain the oil in. Back at camp I did the oil and filter change, cleaned , oiled and adjusted the chain, added more pressure to the tyres. When I fired Winston up the engine warning light turned off. 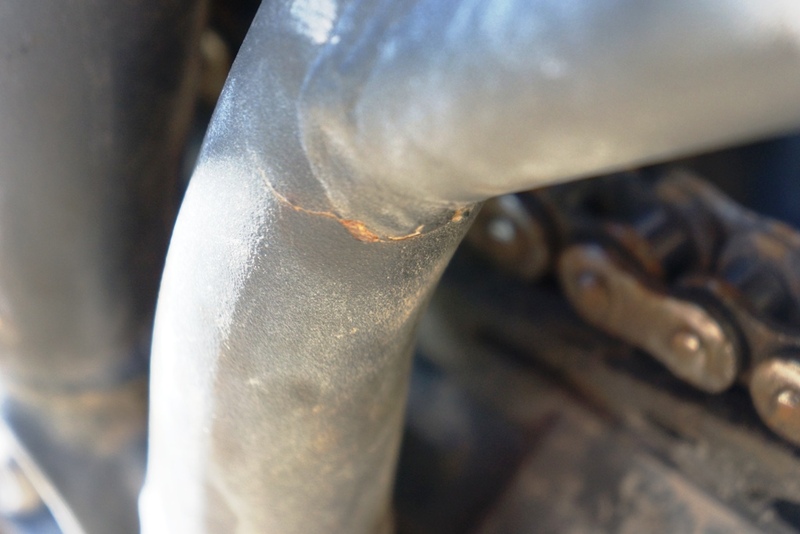 The previous oil was Motul synthetic. It’s expensive and over rated. The oil had done just over 5000km. I walked across to the shop brought some fresh bread rolls and a litre of beer and celebrated I would finally be rid of this place. The campground I stayed for 11 days. Winston all packed and ready to get out of there. Day 530 Tuesday 16th February 2016. At last I was on the move heading south. The winds today were the strongest I’ve ridden in. At times I really had to fight to keep the bike on the road. The roads were straight and boring with very little scenery. It got colder and rained. It wasn’t enough to get wet but I was really wishing id taken my heated jacket and cloves out of my role bag this morning. 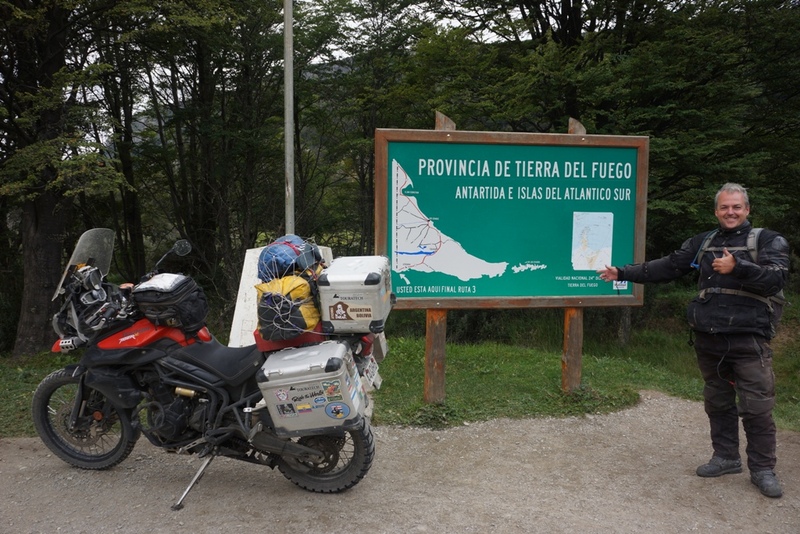 I arrived at Puerto San Julian cold but pleased that we had covered over 480km. I checked into the campground, put the tent up and then went for a walk along the waterfront. In the Bay right next to shore were two Commerson’s dolphins. They are only about 4 foot long and are also known as the Panda dolphin due to their black and white markings. I also spotted a seal frolicking about in the water. 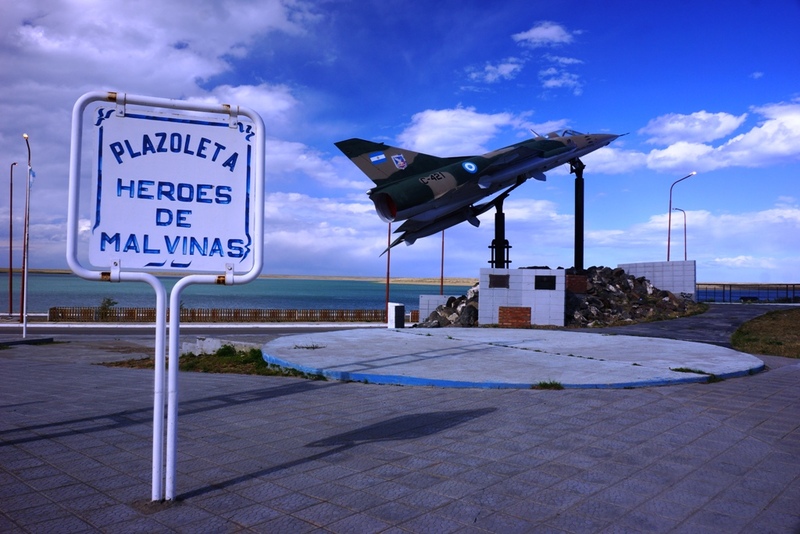 I carried on until I reached a memorial celebrating the Argentine heroes of the Falkland’s war. 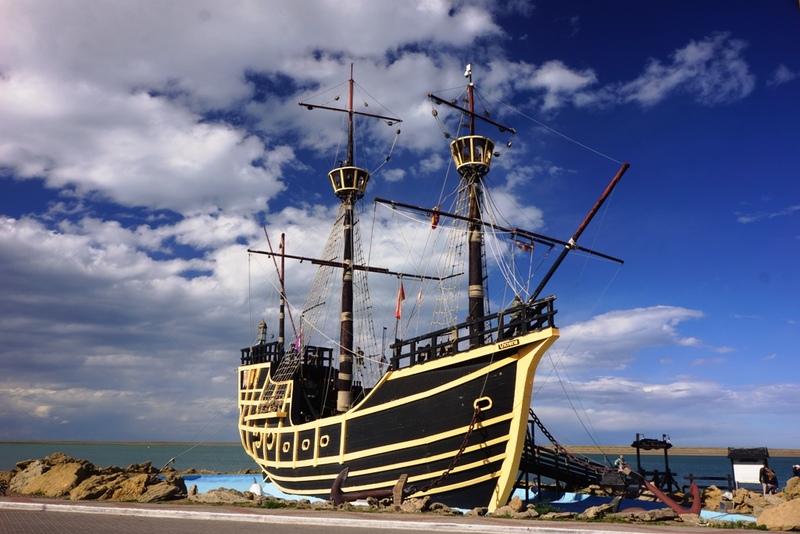 From there it was to a replica Galleon and then a pleasant walk in the fading sun to camp. Puerto San Julian where I saw the dolphins and seal. There are also penguins. Day 531 Wednesday 17th February 2016. It was an early start as the forecast was for a windy afternoon. It was a cool morning and the prospect of riding in the cold had no appeal at all. I don’t mind admitting that when it comes to cold, I’m a wimp. With my thermals, heated jacket and gloves on I was ready to battle the cold. As I left camp I adjusted the remote control for the gloves to just over half and the jacket to a half. The magic of heat penetrating all over your hands, your neck, chest, arms, back and stomach is sheer bliss. The roads were sealed, straight and boring but I was smiling. I was toasty warm. The roads I travelled today had the freshest blood I have seen on any road. There is a lot of wildlife either side of the road. I saw, Armadillos, sheep, Rheas (They are only found in South America and related to the Ostrich),Guanaco’s which are tall ginger and white Llama type animals and a fox. There are plenty of Guanaco carcasses on the side of the road. I made good time today and camped at Reo Gallegos. Day 532 Thursday 18th February 2016. It was a day of contrasts. 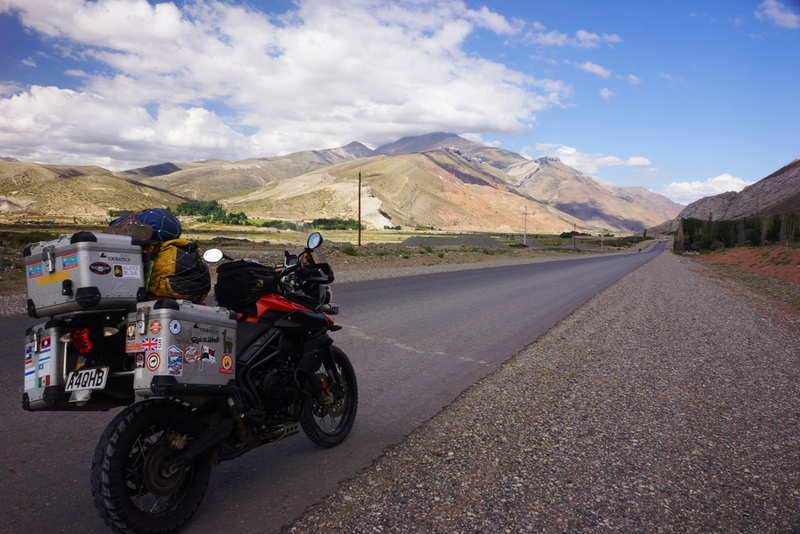 The 480km journey involved two border crossings, crossing from Argentina into Chile and then Chile back into Argentina. The crossings were quick and well organised. 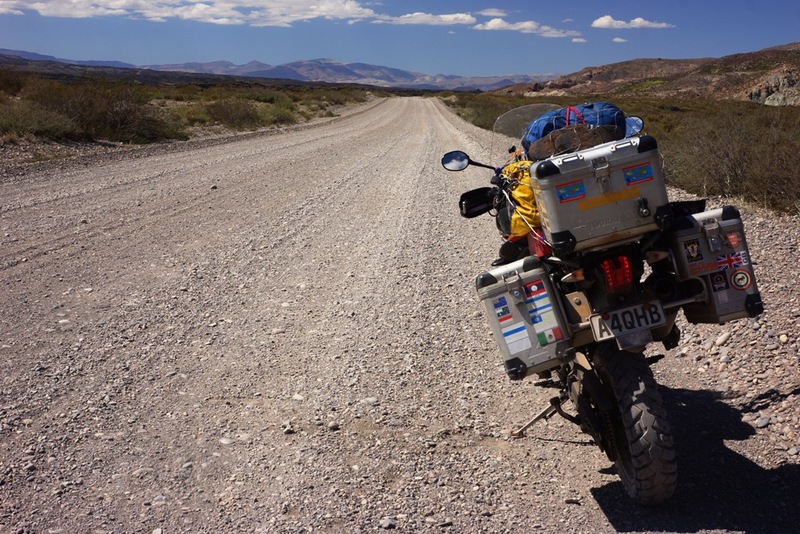 Not long after you cross into Chile the sealed road disappears and turns to gravel that stretches 122km.There were a few corrugations and some loose, deepish gravel in parts. In comparison to some of the roads I’ve ridden it wasn’t too bad, it was a top gear ride most of the time. Once off the gravel it wasn’t long before I reached the ferry terminal where there was a queue of cars, lorries and buses waiting. The wait wasn’t long and before I knew it I was on the other side of the channel. I continued south through Rio Grande looking for a place to camp but couldn’t find one so continued on with the Duran Duran Rio Grande song on repeat in my head. I found a campsite on my GPS, on my route so entered that. When I arrived the camp was there but all closed. I continued until I found a site at Tolhun by lake Fagnano. The camp was a strange place with wooden wigwams to pitch your tent inside. Mine was too big so I pitched mine outside next to the lake. It was 8:30pm by the time I was set up. I cooked up a late dinner while I watched the wind cease and the lake become still. The ferry crossing down was smooth sailing. When the wind dropped the lake became smooth and reflective. The last of the sunlight streaming through the clouds. Today was the day I would complete my around the world ride. 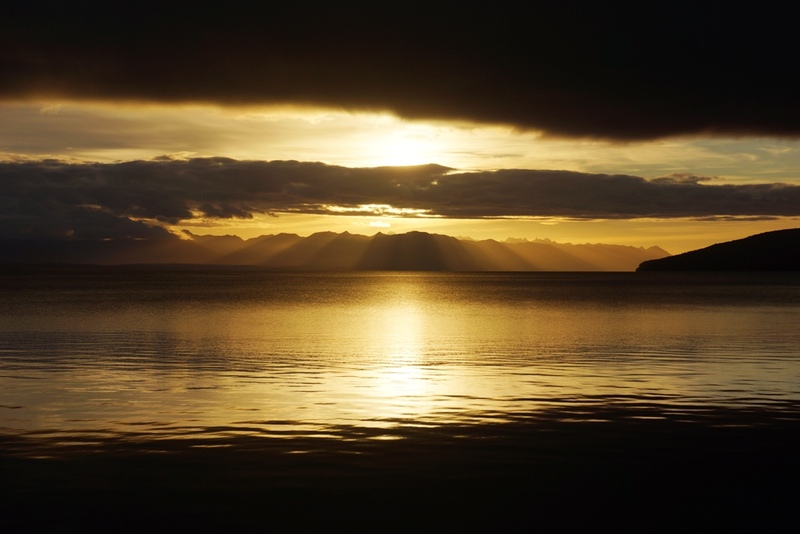 Ushuaia is the furthest town south in the Americas. I was heading there but would head to the furthest point you can travel by road. It is the official end of Ruta 3. 80km from Ushuaia the mountains and lakes appeared and so did the rain. As I rode I thought of the experiences, the places and the people I had seen and met along the way. It has taken me 17 months and I’ve ridden over 90,000km to get to this point. I felt a sense of excitement and the feeling of achievement. It was satisfying knowing that whatever obstacles were thrown in our way we managed to overcome them. It was ironic that the last part of Ruta 3 was gravel, the very same type of road that broke Winston and tried to put an end to our trip. We just smiled and rode to the end. At the end is a car park and two signs. One sign with a map of the area showing Ruta 3 and the other sign saying you have reached the end of the road. I rode Winston through the posts, which are to keep vehicles out and waited to get a photo. There were lots of tourists wanting their picture taken. There were busloads of them. I asked one woman who spoke English if she would kindly take my photo with Winston at my side. She asked me where I was from, I told her I’m from New Zealand, I’ve travelled over 90,000km and it’s taken me 17 months to get here. She went” wow”,I could see in her eyes she felt this was quite an achievement. She told one person and then they told the next and before long I had dozens of people standing next to me getting their photograph taken and patting me on the back. It was only then I realised the magnitude of this achievement. Inside I felt a quiet satisfaction that the job was done, and the excitement of knowing it won’t be long until I’m back home with my family. I will always keep Winston. We have gone through so much together, moments of deep frustration, jubilation and sheer amazement at the wonderful scenery, wildlife, architecture and people. This has been a magnificent experience! Not far now as we head into Ushuaia. The sign shows we are the furthest south you can go by road. After 17 months and over 90,000km Winston and I celebrating we have ridden the world! 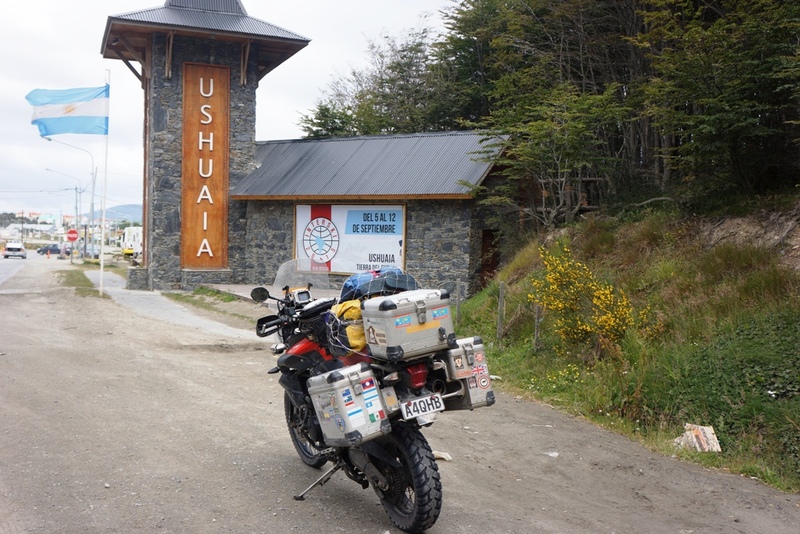 We left the end of the road headed back through Ushuaia in the rain and headed towards the planes to Rio Grande. I stopped for fuel and managed to get wifi at the petrol station. I found only one campground on Google maps so headed there. When I arrived the place was closed. It was getting late so I headed to the nearest Hostel. They were full. I asked if I could camp out the back He said that was ok so I pitched my tent on the grass in a car park and stayed there the night. At the Hostel I met an Aussie guy who had been on the road over 4 years. He was travelling on a 300cc Chinese trail bike. It has broken down on him so many times but he keeps going. He was an interesting guy. It rained last night so I left later than usual as I waited for my tent to dry. It was a lovely blue sky morning. The plan was to head to Reo Gallegos and stay at the same place I stayed at on the way down. As I rode out of Rio Grande the wind picked up and the rain came. The wind was horrifically strong. I had to ride Winston like a Moto GP rider hanging off the side, even then the wind would blow me towards the edge of the road I would literally have to throw my body weight off the bike into the wind to stay on the road, and the rain blew horizontally. The rain stopped but the wind persisted. When I arrived at the ferry terminal the ferries had been cancelled because of the weather conditions. I waited for 7 hours until the ferries began to operate. By this time there were massive queues. To me the conditions looked just as bad. Because the wind is so strong Winston is guzzling fuel like an alcoholic in a beer factory. 13.8 km/l, compare this with the best fuel consumption in high altitude of 25km/l then there’s over a 100km less per tank than normal. Just as well I carry spare fuel. I filled up while I waited. It was time to get on the ferry, the ramp was down and the sea was crashing over it with sea water swirling everywhere. When I rode down the concrete ramp the boat ramp was under water and I had to guess where it was, the sea was deep and I missed the ramp ant hit the square edge of the ramp, boom went my forks as they bottomed out but onto the ramp I went. It was much easier getting off on the other side. It was a very windy ride back north. Customs and Immigration took longer because all of the people who waited for the ferry then had to wait to get processed. 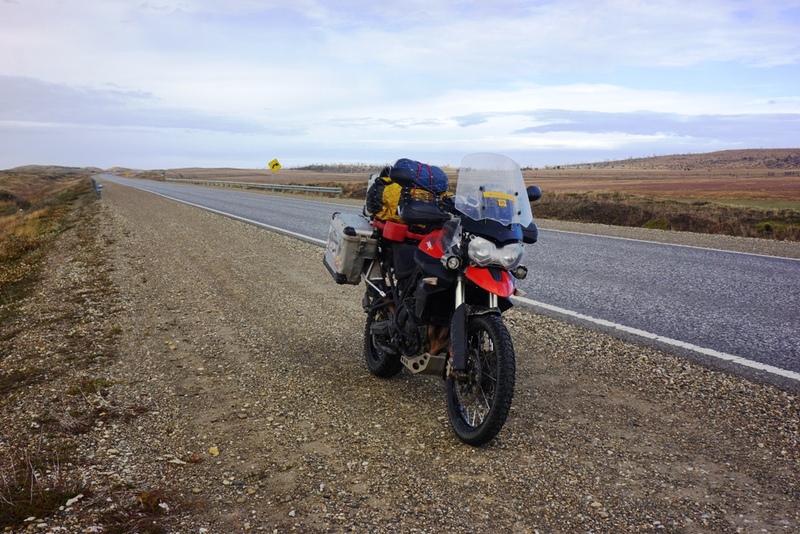 The winds never let up and it was an arduous ride to Rio Gallegos. It was probably the most dangerous riding I have done. Queued up waiting for the ferry service to resume. I stayed at camp today. It was time for a rest. I noticed that the wind had got the better of my mudguard yesterday. The front right fork protector piece is gone. I repaired it as best as I could with the trusted cable ties and Gorilla tape. Hopefully it will last the next 3000km of the trip. 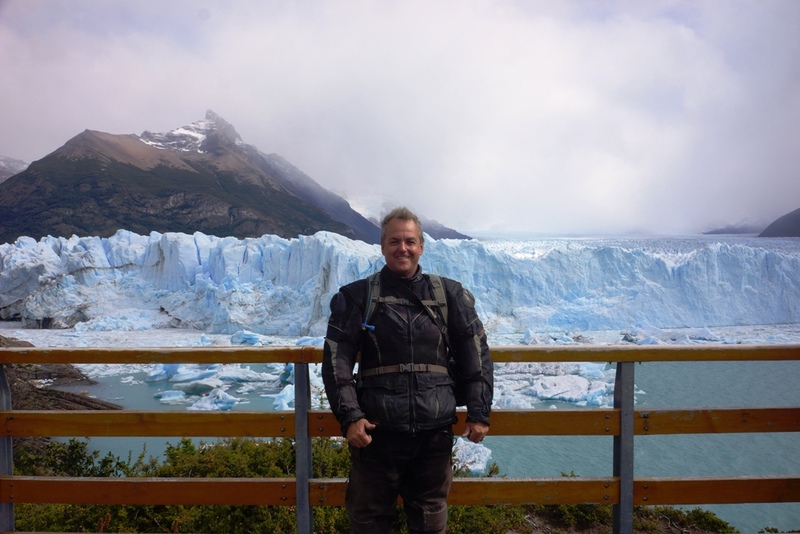 Today was a visit to the last site on my list, the Los Glaciares National Park featuring the Glacier Perito Moreno. The park covers an area of 600,000 hectares; it was declared a world heritage site in 1981. Admission to the park cost 270 pesos and for that you get a day there and a free shuttle bus to the Perito Moreno Glacier. I decided to do the 1km walk up around the lake to the Glacier. The Glacier is 250km2 in total and is 30km long. 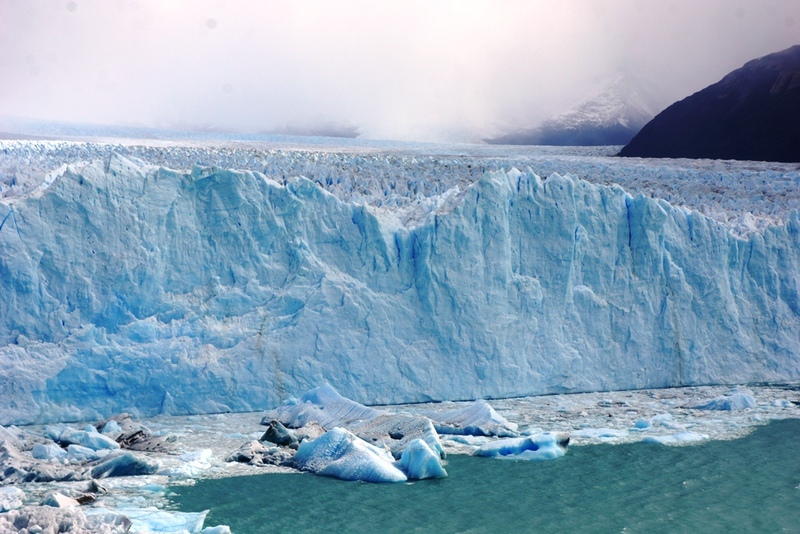 It is one of 48 glaciers in the Southern Patagonian Ice field which is the world’s third largest reserve of fresh water. 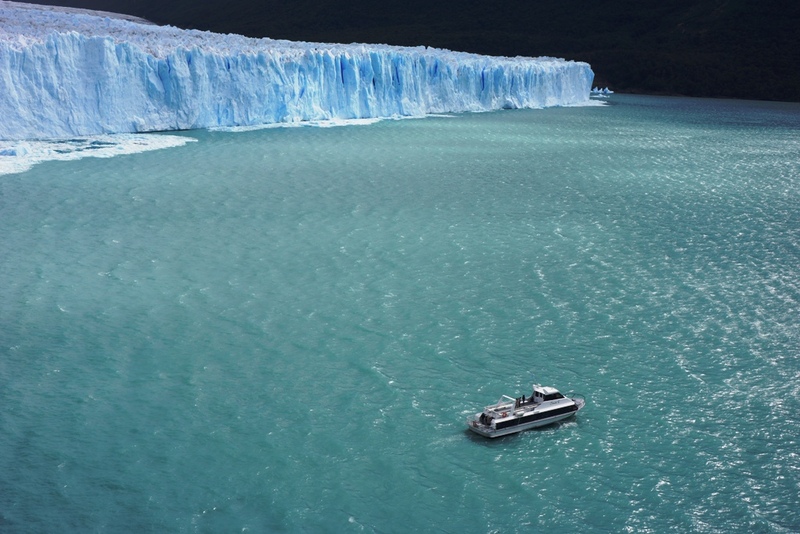 It is a spectacle to behold, the ice is blue in parts and it’s the glacier is one of the few that is still growing. Every now and then a crack, sounding like lightning and then a thunder sound could be heard as part of the ice broke and collapsed into the lake. It was cool! The ride there had been in strong winds, not as strong as the day before but strong enough to finally kill my front mudguard. I heard a tapping noise then a squeal, then smelt burning rubber then saw the mudguard disappear into the distance in my rear view mirror. It did well to last this long. I ended the day at El Calafate. This gives a perspective of scale. Its that guy again. Hey!, where's the blue T - Shirt? Today was about get some km done. I ended up doing over 600km, 160 of that on a gravel road which was in pretty reasonable condition. Today would have to be the most isolated day of my trip. Once I was out of the town I saw no one for over 4 hours. The gravel road I ravelled had not one car. There was so much wildlife on it, armadillos, foxes, the Guanaco’s and Rheas. It was clear this road saw very little traffic. I stayed at the campground I stayed at on the way down in Peurto San Julian. 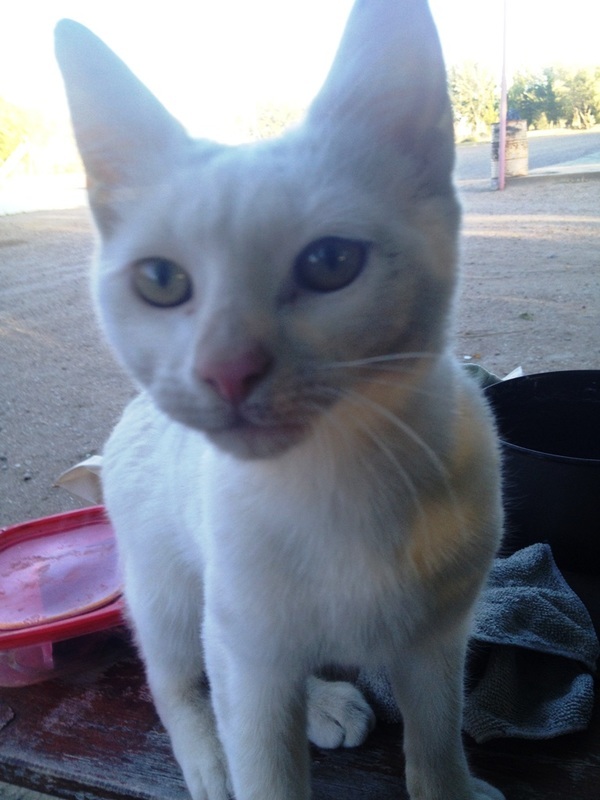 There’s a little white cat who keeps me company, he’s very friendly and purrs a lot. In Argentina there are very few ATM machines that accept chipped debit cards, the ones that do only allow you to withdraw 2000pesos which is about NZ$220, US$140. There are very few towns that have the machines and so getting money is a problem. I’m almost out so need to ride over 360km to get to a bank with the correct machines. With my stash of fuel I should make it. I found a bank in Peurto San Julian that was able to change my remaining Chilean Pesos to Argentinean ones. That gives me enough cash for petrol and food until I can get to Banco Patagonia where the ATM machines are that accept chipped cards. I headed north east along Ruta 3. The landscape is flat and covered in scrub and tussock grass. The roads are straight and boring. At the side of the road there are km markers, on the left odd and on the right even. To keep myself amused I look for the numbers that are the same as a year and put an event to them, so today as I headed north the km numbers declined. 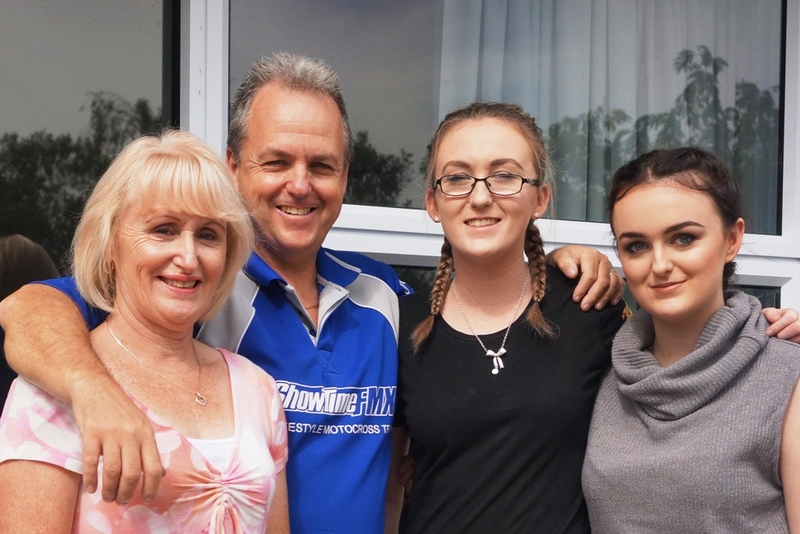 I looked for my daughter’s birth years, 1997 and 1996,then, the year I was married, the famous year if your English and are into football, 1966, my parents birth years 1937 and 35 and so on. Anything to keep your mind active. Another long day of straight roads! The scenery has changed from scrub to farmland, this occurred around the 1000km marker. I ended the day completing close to 700km. During the day I get many vehicles flash their headlights at me. I never really know what this means, firstly I think it’s a warning that animals are on the road, secondly I think there is something wrong with the bike but 99% of the time it’s just a complimentary gesture to a lone biker. This morning I awoke to the serenade of dogs camped outside my tent, I don’t know what song it was, maybe it was who let the dogs out, but they were out of tune. Through my stinging eyes I could make out it was 4am. I managed to get 3 hours more sleep, and then I was up, packed and ready to go. I did notice the choir were sprawled out on the grass next to where my tent had been, fast asleep. Talk about a dog’s life! It was more straight roads and farmland as I watched the kilometre markers displayed kilometres get less and less. I’ve been told by many Argentineans to be careful because I’m English; there is still a lot of animosity towards us because of the Falklands war. 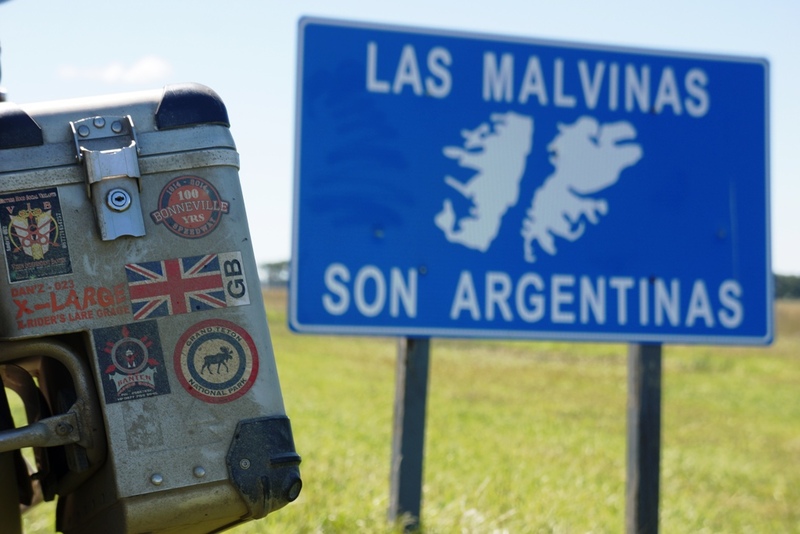 The Argentineans call the Falklands the Malvinas. 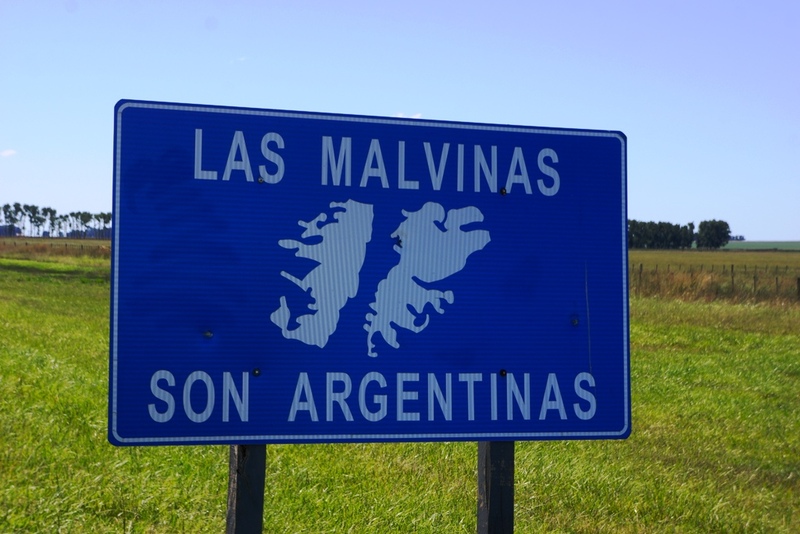 I’ve passed many official signs that say Malvinas Son Argentina. The Falkland’s war was in 1982 and began with the Argentineans invading the islands. 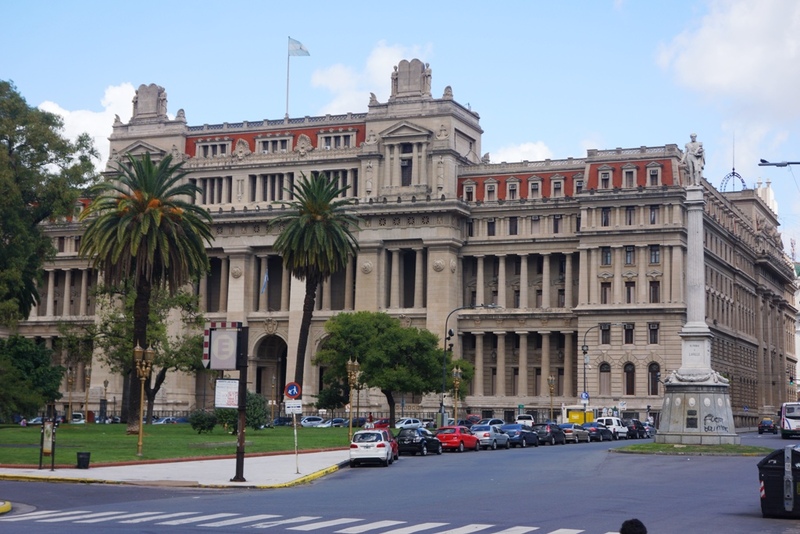 The islands are a British dependency, the military Junta in Argentina at the time were very unpopular, and so to get the country back on side and increase their popularity they sent in their forces believing that the British would do nothing. The British government decided to send a task force to retake the islands. The American military said it was an impossible task with so many Argentina troops dug in, fortified and waiting. The British assault was an assault from the sea. The sea battle to date is the largest air navel combat operation since the Second World War. The war lasted 10 weeks, cost 649 Argentinean, 255 British and 3 local civilian lives. The British were victorious and retook the Capital Stanley on the 14th of June and ceremoniously raised the union flag. At the end of the conflict the British had 11,313 Argentinean prisoners of war. I clearly remember watching the war as it played out on TV. I felt proud being British that we had retaken our sovereign islands especially when the Americans military had said it would be impossible. 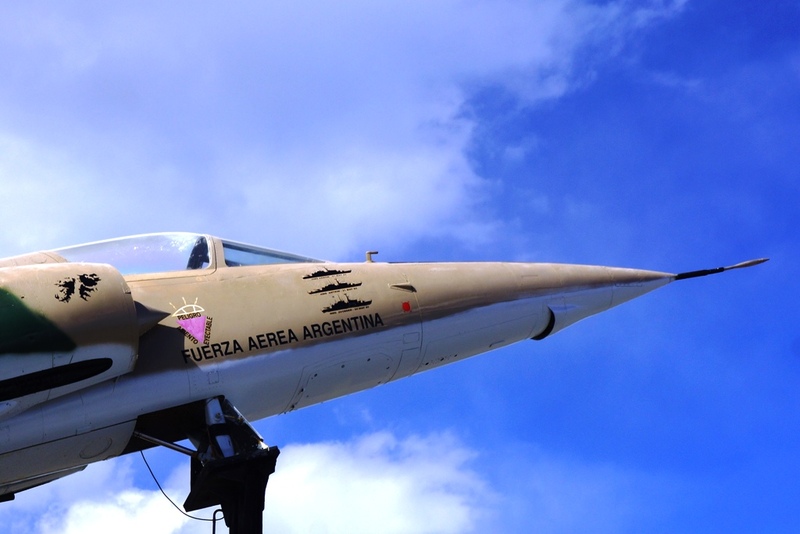 Most of the Argentina naval and air deployments were from places I’ve visited like Ushuaia, Puerto San Julian, Comodoro Rivadaria. 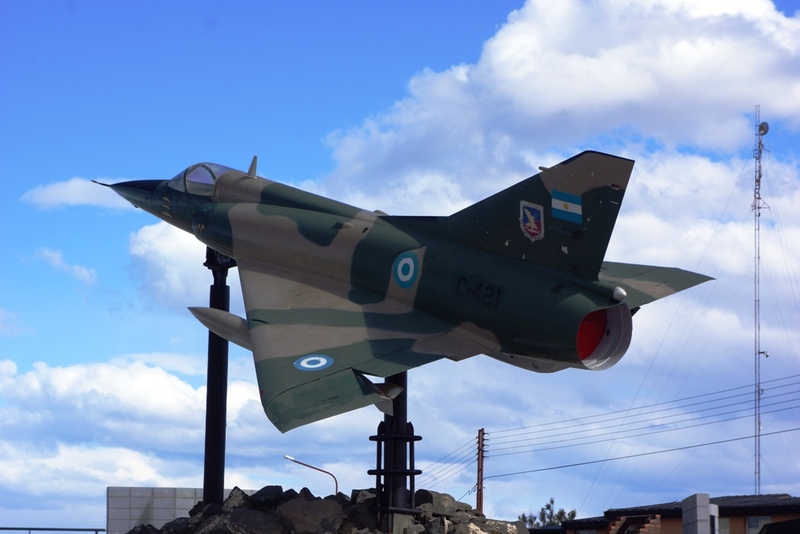 They have their monuments to their Argentinean war heroes and display fighter planes with the names of the British ships sunk in the many battles. As I walked through these places I felt animosity towards those monuments celebrating the killing of British troops. One of many signs. Looks like the son has emigrated to the UK for a better life and doesn't want to come back. Celebrating the sinking of three Royal Navy ships. It was my final day on the road. The end is nigh.!!! 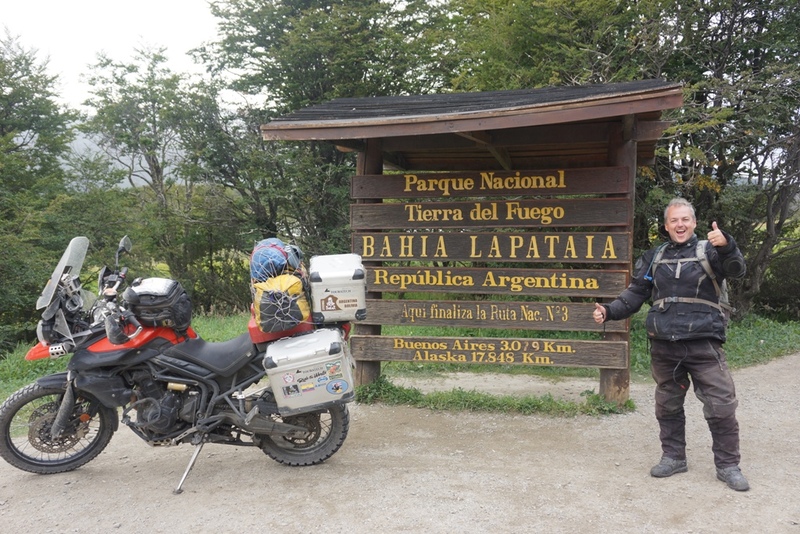 As I rode down Ruta 3 to the outskirts of Buenos Aires I felt sad that this journey will soon be over. The freedom you feel on the road is unparalleled. The inbred desire and lust for adventure and the question of what's around the next corner must be as old as man himself. We all have it; it’s what made the human race the most dominant species on the planet. I arrived at the campground on the outskirts only to be told no camping. I headed off after finding another campground location on my GPS. When I arrived there the area was pretty rough and the place was not well kept. It had no wifi. It would have to do as staying anywhere else but a camp is more than I want to pay. I gave Winston a clean and noticed the weld on the frame to fix the break had broken again. This is really disheartening. During the night I heard what I thought were leaves landing on my tent. When I got up I noticed it wasn’t leaves that had fallen but huge bird droppings. By the look of it they couldn’t be normal birds, perhaps they were the legendary Pegasus, a horse with wings. It was a good reason to clean my tent. I have to do it before I head back to New Zealand or it won’t get through the MAF inspection. 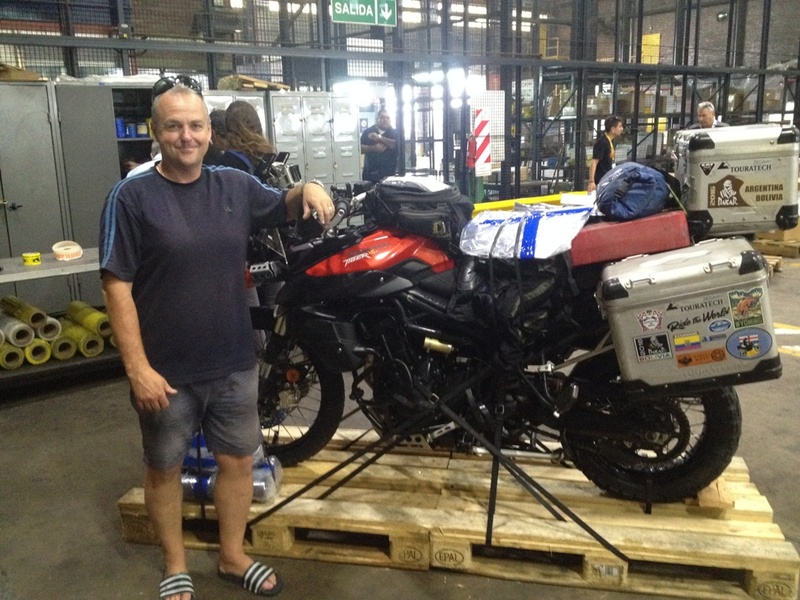 I packed up camp and headed to Dakar Motos. I have decided to use these guys to air freight my bike back to Auckland. I paid the booking fee, collected the paperwork and booked my flight back to New Zealand. I fly home on Sunday. 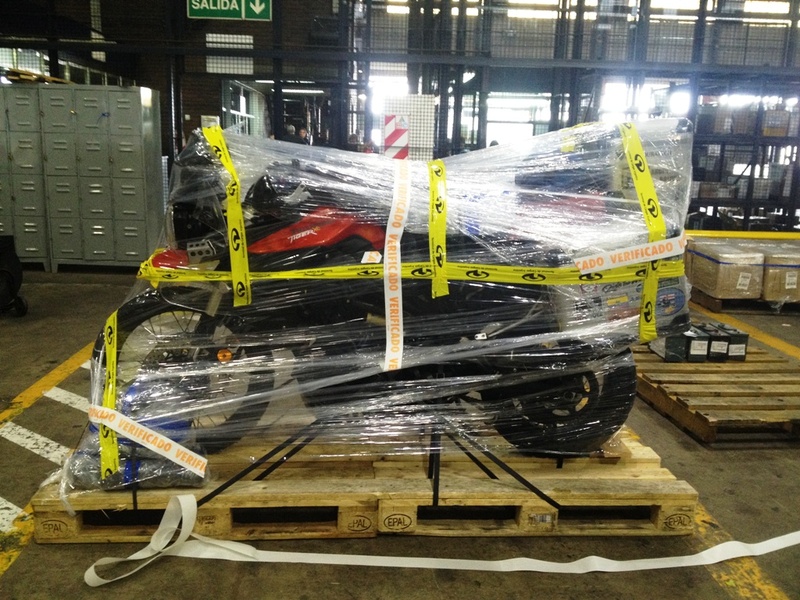 The bike needs to be thoroughly clean and dropped off at the cargo terminal at airport on Thursday. It appears no personal items or camping equipment can be shipped with the bike. I find this very strange. It’s the only place I’ve been that this is a requirement. I headed to another camp on the other side of town by a river. I had spent some of the previous night cleaning my bike in preparation for shipping. Winston wasn’t perfect but there wasn’t too much more that needed doing. As I got closer to the campsite the road turned to dirt. It was dry so there was lots of dust. I rode really slowly to minimise the dust. At camp there was no wifi again, but it was right next to the river and I was the only one there. I watched the boats cruise up and down. 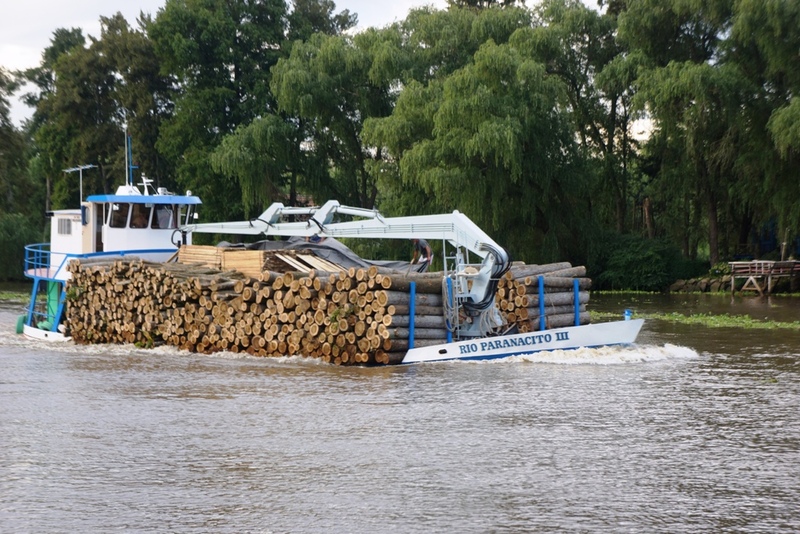 There were various types from speed boats, small ferries, logging boats to small open wooden fishing boats. There were lots of plants floating down stream. They originate from Paraguay. This only occurs in February and March. It was a pleasant way to spend the evening watching the boats go up and down the river. 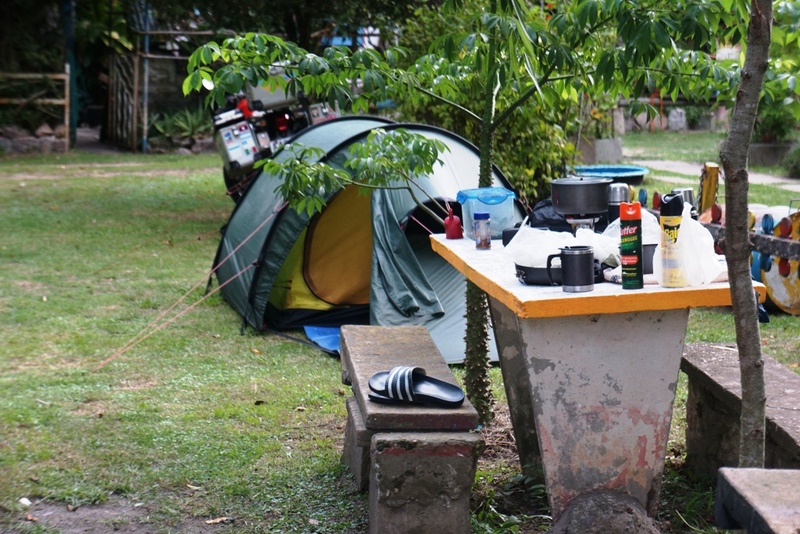 During the night it rained heavily so in the morning I decided to wait for my tent to dry before heading off. When I rode out of the camp the dusty road I’d ridden yesterday had turned into a quagmire. By the time I’d gotten to the end of the road Winston was thick with mud. There were handfuls of mud on the swingarm, skid plate and just about everywhere else. There was no way I could clean the mud by hand as it was in every orifice of the bike. I needed to find a place with a water blaster. More of a priority was to find a place with wifi. I need to be able to make an online money transfer to pay for the bike when the final cost and Airway bill are sent from Dakar Moto. I headed to a couple of petrol stations before I found one that had good enough wifi to search the internet for somewhere to stay. I found a place on Booking. Com, booked it then looked to find a carwash with a water blaster. They don’t have car washes in Argentina that have water blasters you operate yourself you have to find a car grooming company. I asked around and with gestures and a few grunts managed to find one. A couple of young guys set about giving Winston a good squirt down and the worst of it was off. I headed to the cheap hotel I’d booked and slept in a bed for the first time in a long while. 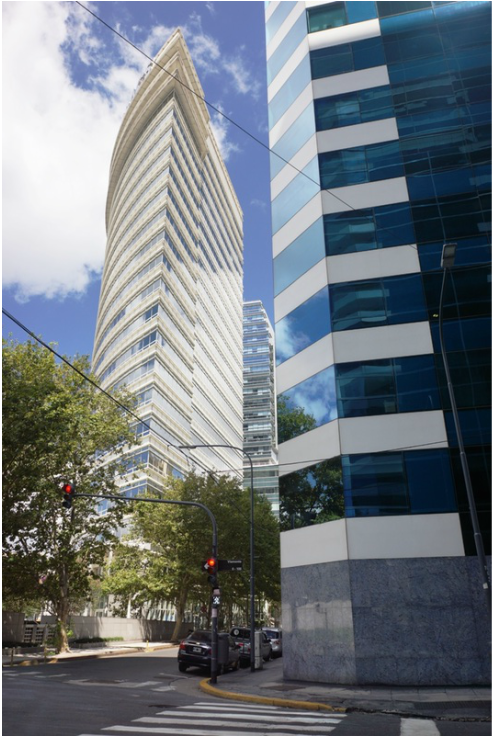 I decided to get a hotel I could stay at for the remainder of my time in Buenos Aires. I got one closer to the city and unloaded the gear from Winston. I spent most of the day with a toothbrush cleaning every bit of dirt from the bike. I then gave it a good spray down with silicon. Then it was time to throw out the things I couldn’t take on the plane, clean all my gear thoroughly and then take it easy. I had to be at the Ai Cargo terminal at 10:30am to get Winston ready for the flight. I arrived early and did a bit more cleaning of Winston and the inside of my panniers. By the time I’d finished the freight representative came to meet me and we went through to the warehouse. I rode Winston onto a pallet to begin the process of readying him for the flight. The warehouse guys strapped Winston down and made sure he was secure. I had to ensure I had between one and two litres of petrol in the tank, battery disconnected with terminals taped, windscreen and mirrors removed and tyres partially deflated. I then loaded all my riding gear on to Winston. The airline representative then came and had a look, then the customs guy. While this was being done the freight representative was discharging my temporary import permit. Once this was all done Winston was wrapped in plastic and I was free to go. I headed back into town via a shuttle which was literally 10 times cheaper than a taxi. Good by me old mate, see you back in Auckland. Winston is "wrapped" to be going home! I finished my cleaning exercise by making sure my tent, tent bags and pegs were immaculately clean. 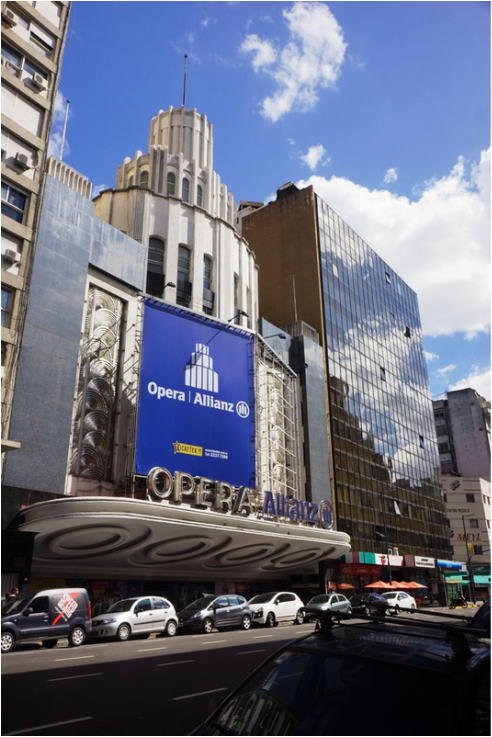 It was a day of exploring Buenos Aires, the first stop the most visited attraction, the Opera house. I did an hour tour which was interesting and informative. 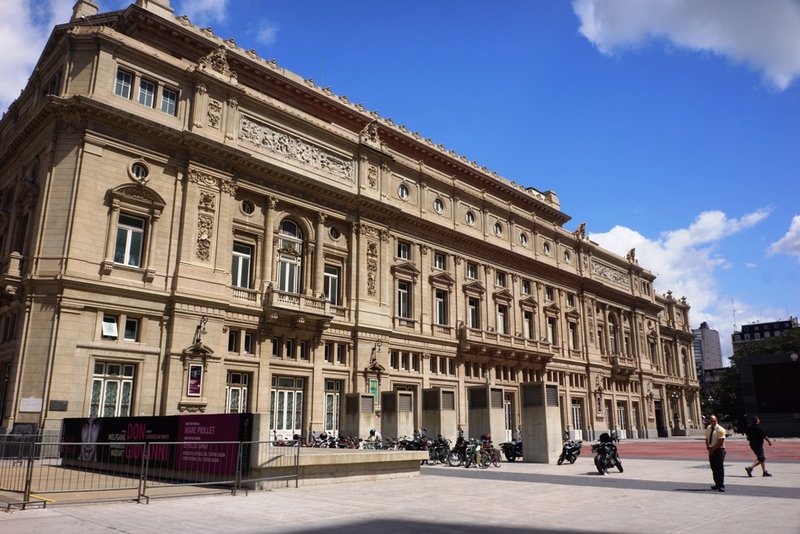 Pavarotti has reportedly said that he doesn’t like singing here as the acoustics are so good you can’t make a mistake because it’s so easy for the audience to spot. It was then down to the waterfront which is similar to the east end of London with old warehouses converted to up market restaurants and shops. 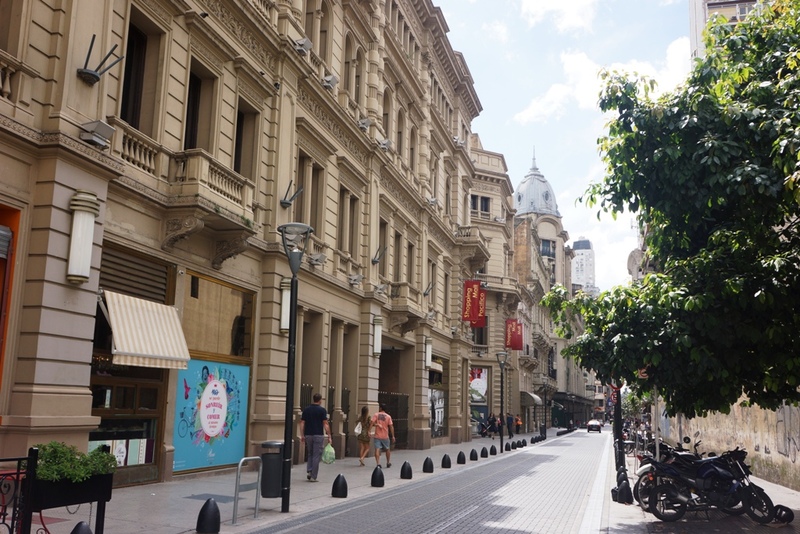 Buenos Aires is a very European styled city, with many old 1800’s classic buildings. The inner city is clean and tidy with some of the outer areas dirty and rubbish strewn. 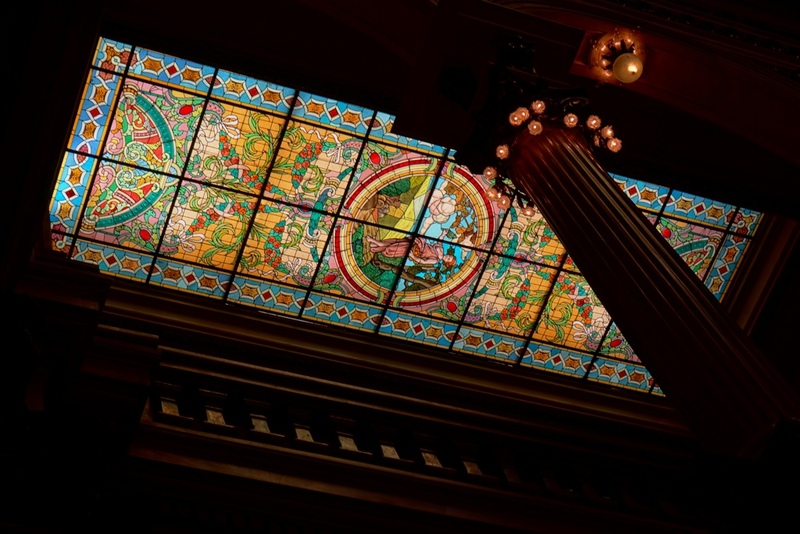 The Opera House has some magnificent stained glass roof windows. The waterfront. A mix of old and new buildings. There are many European styled buildings and monuments. 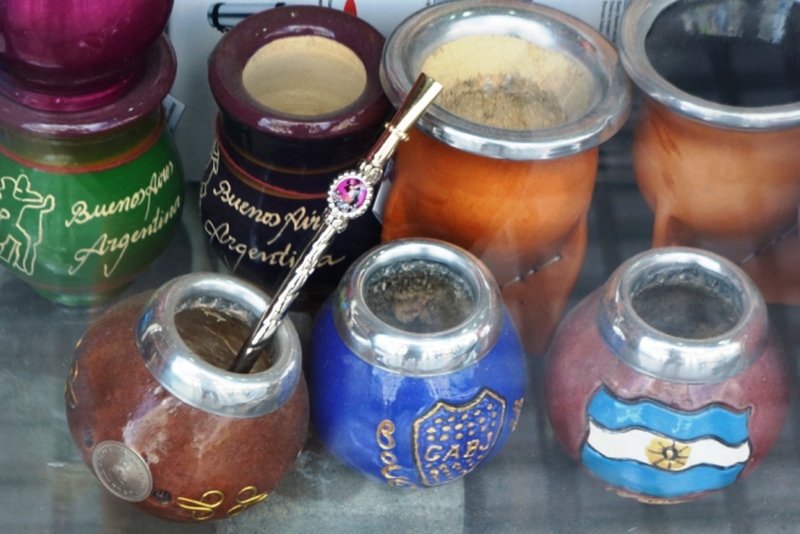 The Argentinians drink a strange type of tea. The cup is filled with leaves and a small amount of hot water. They drink the liquid through a filtered straw and keep filling the cup with hot water. I tried it but it. It must be an acquired taste as it wasn't to my liking. It was the last day of my trip. Gear all cleaned and packed? Check. Paperwork ready? Check. Taxi booked? Check. At 8:30pm the taxi arrived and off to the airport I went. The trip to Auckland was a 13 hours and 15 minutes. As the tyres of the plane touched the Auckland runway with a bump I realised this was the end of an 18 month adventure and that the dream was over. When I look at the statistics of the trip I’ve visited 29 countries, ridden 94,400km, taken 14 flights, camped for 5 months, lost 18kg in weight gone through 9 pairs of sunglasses, 3 sets of chain and sprockets, two chain guards, one front mud guard, 5 front tyres, 4 front tyre inner tubes, six rear tyres, one rear inner tube, one clutch, one clutch cable, one battery and one spot light. I had begun my trip believing that the world was full of bad people doing bad things. I returned believing the world is full of good people doing good things; yes 99.99% of people I met were good. I was humbled so many times by their generosity. I also saw the 0.01% of the bad. Good bye and thank you for accompanying me on this chapter in my book of life.